After a spectacular first and second round in the debate boxing ring for Hillary Clinton and Donald Trump – we are off to the final round. 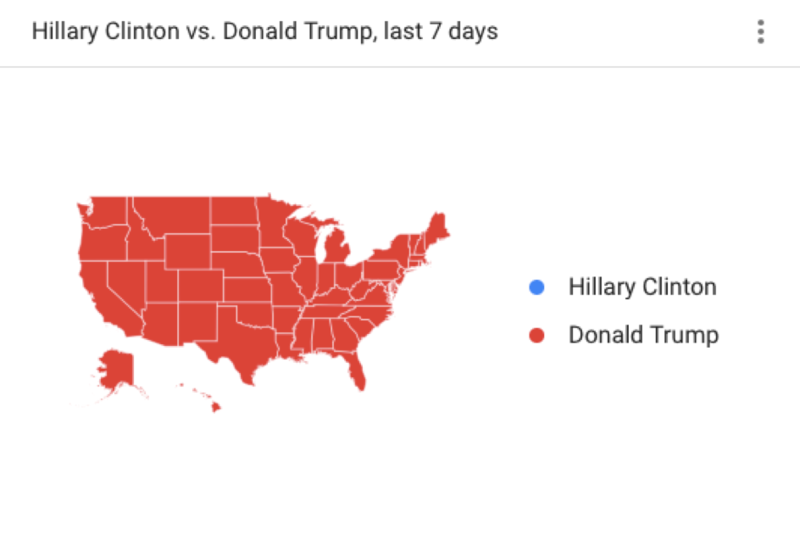 And what we can see from Google Trends – America is still staggered by Donald Trump’s latest remarks. For our third analysis, we updated again the initial keyword set. After having lots of fact check related keywords in our last analysis, we now included “presidential debate fact check” and “presidential debate fact checker” keywords. Also we added some brand new keywords – for example “rigged election”, “race” or “florida vote by mail” , any many more you can see at the end of the text. After Trump’s latest accusation of a voter fraud and a controlled media, we will later on take a look how the publishers performed in the mobile AMP carousels for the highly discussed topic of a “rigged election”. Now we’ll take a look at the top 10 publishers of the updated keyword set. 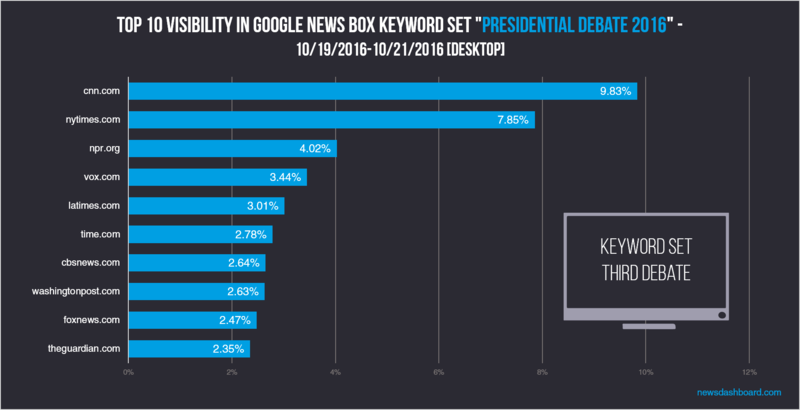 Therefore we looked at the visibility in the Google News Boxes for desktop and mobile and the AMP Carousel between 10/19/2016 and 10/21/2016 – to get some round up information of before, during and after the debate. Cnn.com on top position for desktop and mobile with the updated keyword set. As we can see cnn.com went the full distance and wins gold for the second time. But most of the other “usual suspects” made the top 10 as well. As we can see nytimes.com is on the second place with a visibility of 7.85% – for the third time in a row. 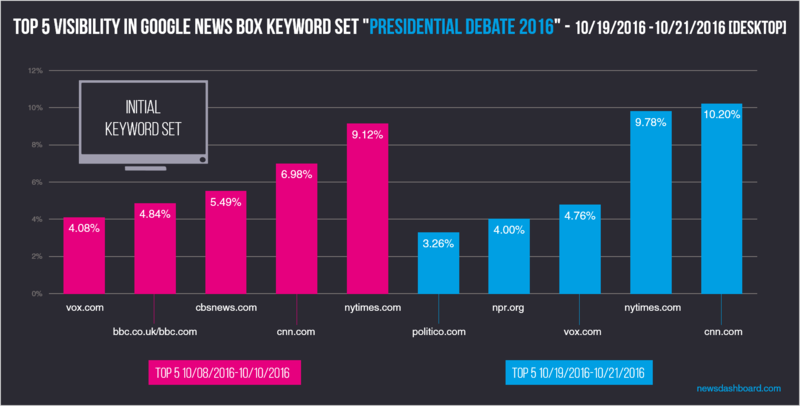 Npr.org, cbsnews.com, and the washingtonpost.com made the top 10, just as in the last two debates. Congratulations to these publishers. Vox.com on the fourth place in desktop is on the other hand a small surprise. Cnn.com takes the lead again. When we take a look at the visibility in the Google News Boxes and mainly AMP Carousels for mobile we see a familiar picture with cnn.com on the top position. Still we have some major differences. Usatoday.com, breitbart.com, timeinc.net, abcnews.go.com and yahoo.com are in the top 10 for mobile visibility, but not in the top 10 for desktop visibility. Especially breitbart.com is again highly visible with a rate of 3,60%. We can also see that the difference between the competitors is significantly less than in the top 10 publishers for the Google News Box desktop edition. So let’s take a look at the top 5 publishers from the second and third debate. Therefor we used our initial keyword set which you can find below as well. Top 5 mobile in comparison for second and third debate. As we can see cnn.com is still on first place, but the competition has grown stronger as the mobile SERP is concerned. From a 6.02% visibility rate, cnn.com went now a bit down to a visibility rate of 4.55%. Breitbart.com is still on third place with a slightly reduced visibility rate of 3.92% and cbsnews.com is on fifth position again. Position two and four have changed. Instead of washingtonpost.com on second place and nytimes.com on fourth place – we have now usatoday.com on second place and foxnews.com on fourth position. Before our brand new graphic, let’s take a last look at the comparison of the top 5 visible publishers in the Google News OneBox for desktop. Cnn.com barely beating nytimes.com in comparison for desktop visibility second and third debate. Even though cnn.com is hands down the front runner in this analysis – we see how nytimes.com was able to beat them the last time. Now cnn.com is barely beating nytimes.com with a difference of less than 1 percentage point. And as we can see npr.org still made it to the top 5 with a non fact check related keyword set – good job from a Google News SEO view there. Now on to our newest kind of chart. 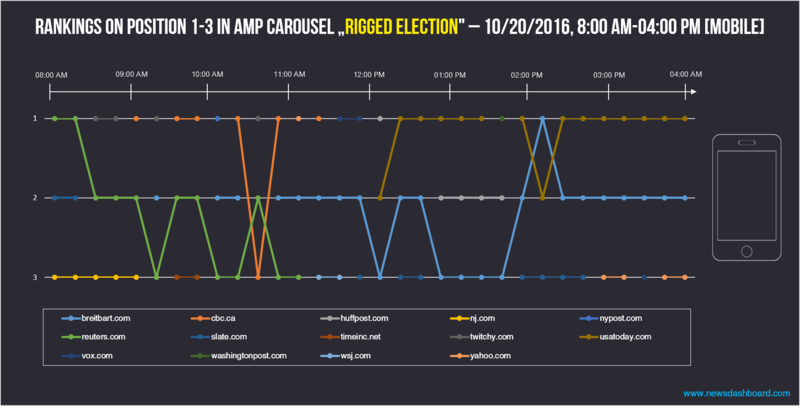 We looked at the top 3 positions in the AMP Carousel for mobile between 8 AM and 4 PM for the keyword “rigged election”. We wanted to see how much the publishers change in the top rankings throughout the day in the AMP carousel for such a highly discussed topic. A fight for the top positions in the AMP carousel. As we can see at the beginning of the day reuters.com is on the highest step of the podium. But dropped right after 8 AM to the second and third position – while still changing between those two, right after 11 AM reuters.com finally dropped out for good. Breitbart.com manages to nearly stay all day in the top positions after making its first appearance between 9 and 10 AM. Even climbing up the ladder to the top at 2 PM. Also usatoday.com is strong in the AMP carousel from noon till 4 PM. Other highly visible actors in the top 3 are for example cbc.ca, wsj.com and rj.com. So we see that the top positions in the AMP carousel are varying as strong as we are used to in the desktop Google News OneBoxes. 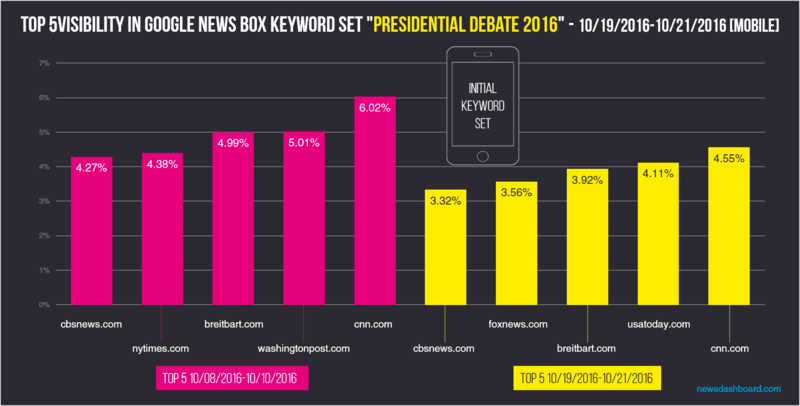 For this specific keyword the publishers with high visibility figures are remarkably different than in our other analyses around the debates. 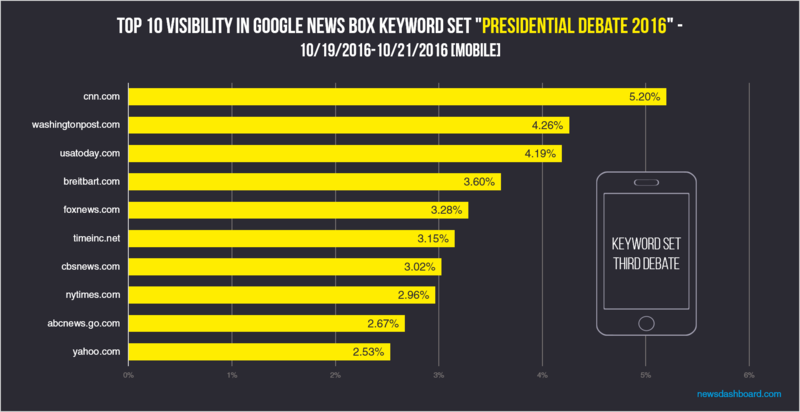 To conclude our analysis for the last presidential debate we have to say that there is a strong difference in mobile and desktop results. While the visibility differences in the mobile visibility analysis were very close, we had a clear overall winner for the desktop visibility. Now we are looking forward to the presidential elections and we will keep you updated with more further analyses on Google News and the News OneBoxes for desktop and mobile.